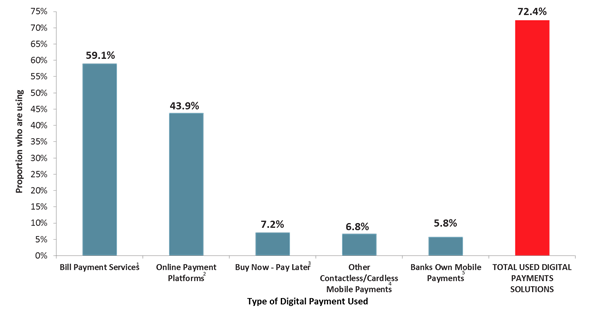 Most Australians are now using digital methods of payments when shopping according to the latest Roy Morgan research, with 72 per cent using at least one digital mode of payment over an average 12 month period. The Digital Payment Solutions Currency Report showed that the trend is likely to continue, posing a potential threat to existing banks if they don’t take action to compete with the latest technologies. The survey of over 50,000 consumers also found that 1.5 million people have used ‘buy now, pay later’ systems such as Afterpay, zipMoney and zipPay over the last 12 months. Other newer digital payment systems outside of the major banks including Android Pay, Apple Pay, Samsung Pay and Google Wallet were used by 8.8 per cent of consumers (1.4 million) over the last 12 months. This was higher than the banks own mobile payments systems used by 5.8 per cent or 1.2 million. “Australians are moving rapidly towards new ways of making payments, changing from the traditional dominance of the major banks to using new entrants such as technology companies (fintechs) and the new innovative start-ups such as Afterpay with their highly successful ‘buy now, pay later’,” Norman Morris, Industry communications director, Roy Morgan said. “As the users of the new payment technologies move from the domain of the ‘technology early adopters’ through to ‘professional technology mainstream’ and other segments, they are likely to become more universal. The increasing use of new payment technologies is being aided by the growing proliferation and development of smartphones and wearables with integrated technology such as Apple Pay and Google Pay, and an increasing number of financial institutions enabling their customers to make payments with these devices. Although, bill payment services (BPAY and Australia Post BillPay) are the market leaders at almost 60 per cent, the newer systems represent a major challenge to these systems. Source: Roy Morgan Single Source (Australia), December 2017 – November 2018, n = 50,561. Base: Australians 14+ .1. Bpay; Post Bill Pay. 2. PayPal; Visa Checkout; Masterpass; Western Union Pay 3. Afterpay; ZipPay; Zip Money 4. Android Pay; Apply Pay; Samsung Pay; Google Wallet 5. CommBank Tap and Pay; ANZ Mobile Pay; NAB Pay; Other Bank/Institution Tap and Pay. 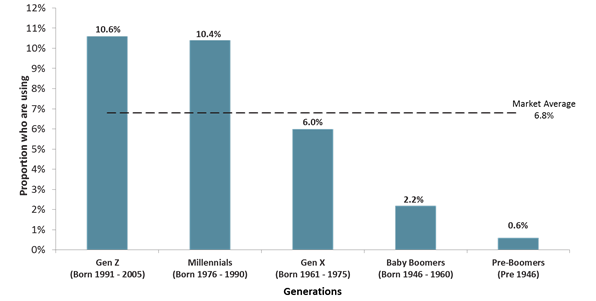 The use of ‘buy now, pay later’ is well above the average as a payment method for Gen Z and Millennials, however, the older generations don’t use ‘buy now, pay later’ as much, with usage among Pre-Boomers only at 0.2 per cent and Baby Boomers at 1.8 per cent. Source: Roy Morgan Single Source (Australia), December 2017 – November 2018, n = 50,561. Base: Australians 14+. 1. Includes: AfterPay; ZipMoney; ZipPay. In a similar pattern to ‘buy now, pay later’, Gen Z and Millennials are the greatest users of fintechs, including Android Pay, Apple Pay, Samsung Pay and Google Wallet. By contrast, only 0.6 per cent of Pre-Boomers and 2.2 per cent of Baby Boomers use these fintechs. Base: Australians 14+. 2 Excludes banks. Includes: Android Pay; Apple Pay; Samsung Pay; Google wallet. Roy Morgan’s Single Source survey is based on in-depth interviews with over 50,000 consumers, which were conducted in the 12 months to November 2018.